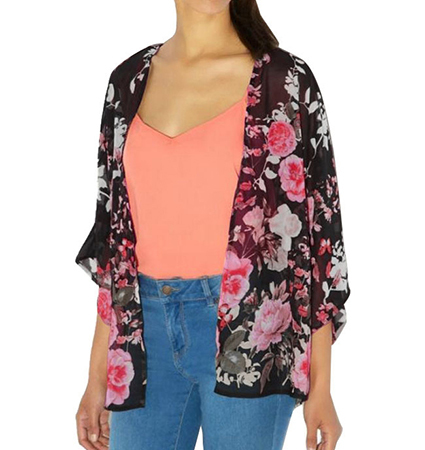 This Womens lightweight kimono top provides a unifying took for any wardrobe. Kimonos are a hot fashion trend right now, and an be seen on the most important fashion runways in the world. This one is a light, flowing piece that has three quarter length sleeves. The length hits below the hips. It is constructed from a lovely floral print in black, pink, white and gray. The hemline is edged by black. We recommend dry cleaning only for this garment. It is available for purchase in sizes Small, Medium and Large.